There are companies like Needle that provide businesses with real time chat and chat operators that consumers and customers can communicate with in order to learn more about a product, place an order, and track a shipment. Apple is making a similar customer service platform available as part of iOS 11 with Business Chat for iMessage. Offered now to those businesses subscribed to the developer preview, Business Chat for iMessage allows customers and companies to communicate using chat. The platform lets customers purchase a product, track shipments and more. Simple tasks related to customer service can also be handled using the Business Chat platform. Apple has integrated this into its own apps like Safari, Siri, Spotlight, and Maps. 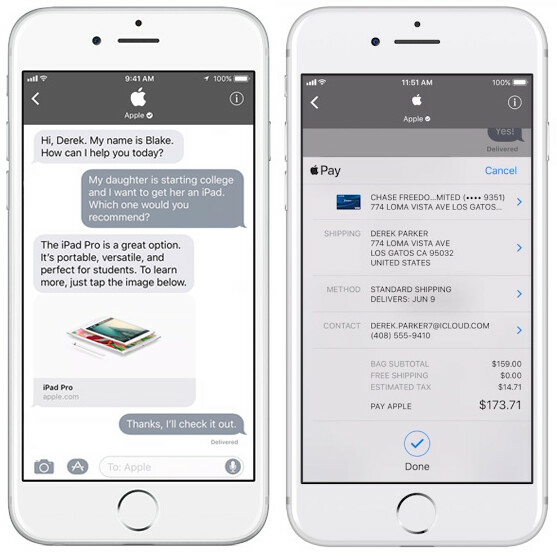 Users will be able to use Apple Pay to make a purchase over chat. And since the messages are saved, customers can refer to them at a later time if need be. With the developer preview, companies can serve their customers using an Apple iPhone or an Apple iPad. To get the ball rolling on a way to ring the virtual cash register for your business, go to register.apple.com/business-chat. Not sure how I feel about this. I know Apple means well with this. They want to give their users even more reasons to continue to use imessage, it actually adds value for the users, but I do see how others can misuse this. There is already this devide where to some vendors, iOS users are just the better consumer to target simply because of their buying power. This will simply make it easier on those businesses to target and continue this devide even more. As a user of both platform, I am not sure this is a good thing for the industry, we have enough divisions in the world as is. Actually Allo has end to end encryption as well, you just have to choose incognito mode. Which makes it as secure as iMessage, signal and the likes. Not all end to end encryption is equal. WhatsApp has back door access. WhatsApp allows for the encryption keys to be reset, after which they could intercept new messages (not the old ones). The sender isn't made aware of this unless they opted in to receive encryption warnings. To turn this on, is always a good thing. But Allo doesn't do this. So it's as safe as iMessage. Goodbye Paypal, Square, and etc!